The Governor of Yobe State, Mr Ibrahim Gaidam, has proposed the establishment of an Emergency Response Centre at the General Hospital in Potiskum, the commercial centre of the state, where a twin-bomb blast occurred over the weekend. Governor Gaidam made the proposal shortly after sympathising and condoling with the families and victims of the blasts which killed five people and injured 48 others in the volatile north-east state. He said that the centre would look into emergencies at the appropriate time with a view to giving the desired response to emergency cases. He then directed the acting Principal Medical Officer at the Potiskum General Hospital, Dr Musa Sarki, to immediately discuss with the Commissioner of Health and present a memo for the establishment of an Emergency Response Centre at the Hospital. The Governor assured the medical official that he would study the memo as soon as it reached his office, with a view to giving it speedy approval. Governor Gaidam while sympathising with the injured persons currently receiving treatment at the General Hospital in Potiskum also prayed for their quick recovery and for the souls of those killed in the attack. He said the State Government would take care of all medical bills of those receiving treatment, including the 11 who have been referred to the Federal Medical Centres in Nguru, Yobe State and Birnin Kudu in Jigawa State. “I assure you that we will provide every support to those injured to ensure they recover fully. We will pay all the medical bills, even if it means sending those who have been referred to other hospitals outside the country,” Governor Gaidam said. 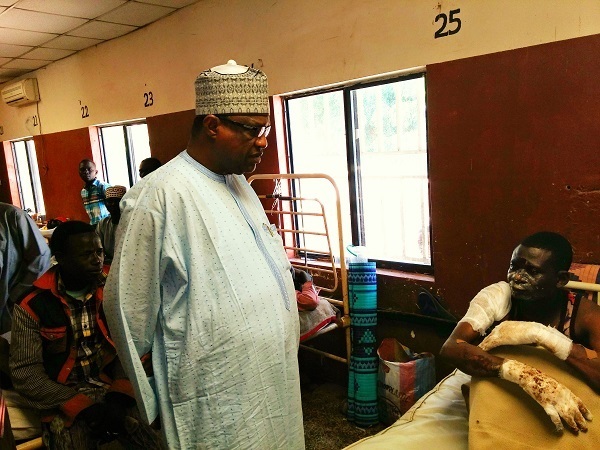 Dr Sarki, had earlier informed the Governor that nine of those injured in the attack were referred to FMC Nguru, two others to FMC Birnin Kudu while the rest were being treated in the Potiskum Hospital. The Governor, who condemned the attack in its totality, described it as cruel and forbidding in its entire ramification and called for severe prayers against the criminals and insurgents in the state and other parts of the north-east. He also prayed for the restoration of peace in the state, the country and the world at large. No group has claimed responsibility for the attack but the Boko Haram sect, which had claimed previous similar attacks, is the prime suspected. The terrorist group has demanded for an Islamic state and an end to western education in the region.